Since the moment Ted Joblin realized he had an affinity for throwing and catching things, he has gone on to perform and lead workshops throughout the US and Canada including venues such as Hersheypark in Hershey, PA, the Frist Center for the Arts in Nashville, TN, half-time shows for the Vanderbilt Commodores, as well as winning the 2007 Most Spectacular Award presented by the Atlanta Juggler's Association. Vanderbilt University has been the enthusiastic home of juggling extravaganzas Juggleville (2006), Juggleville II: Symphony in Gravity (2007), and Juggleville III: Catch-a-Sketch (2008), all of which have featured Ted's directing, choreography, coaching, and performance skills. 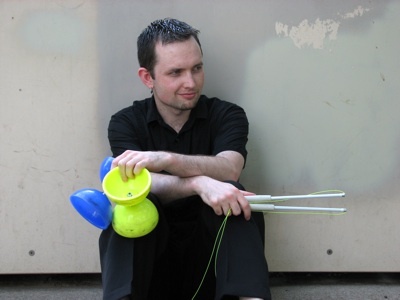 An active member of the International Jugglers' Association, Ted is the youngest judge on the judging panel of the Juniors and Seniors International Championships, and regularly presents Chinese yo-yo workshops for other jugglers from around the globe.